Exactly this day, 31 years ago you left us; but you are as fresh and relevant in our lives even today. And that is the making of a noble and great soul. Every now and then, after a couple of steps I halt to reminisce your teachings and will continue do so. Do you have contact information for any family member of K. P Tripathi? Contact number of his son Kamlesh Tripathi is 9971494795. I apologize for asking a question like this but here it goes anyway: was late Mr. K. P Tripathi related to Professor A.N Tripathi? Prof. Tripathi taught mining engineering at BHU a long time ago. Prof. Tripathi was married to an aunt of mine from my father’s side. My father, Mahesh Kumar Shukla, passed away in 1969 when I was 2 years old. I have never had any contact with my father’s family. I have always wanted to know more about them and the only information I have is Prof. A. N Tripathi was a relative of mine and his brother was once a minister in Assam. 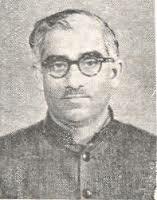 Late Mr. K. P. Tripathi was the elder brother Late Mr A. N. Tripathi who was a Prof in BHU. I happen to be the youngest son of Mr K. P. Tripathi. Prof Tripathi passed away many years ago. His wife (Dulari Chachi) lives in Bhopal with her daughter Chaya. I stay in Delhi-NCR as well as in Lucknow. How about you? If you so desire you could introduce about yourself in greater detail. Some one told me Chaya her elder daughter is no more. And they are not in touch. Just in case you get any information do let me know. Do you have contact with Dulari Devi? Is it possible for me contact?